Wisdom of Life. 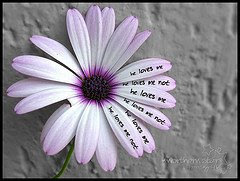 : Does he loves me? A SYT was asking me..."How do I know whether my boyfriend truly and sincerely loves me?" I think is quite simple. If he is crazily and madly in love with her, he should be brave to tell to the world. Does he holds your hand and arm, grips your hip, hugs you over and kisses you openly? If not...please test on him the next time he is with you. I believe all men who loves their women, are proud to show their partners to everyone, more so to their friends and relatives, including the female sides. If the man refuses to show up and is not prepared to be romantic while friends and relatives are around, you have to doubt his love over the lady. Either he is shy or he has own agenda for not letting others know he is the boyfriend. The last heroic test on him. While eating or drinking, kiss to transfer some food or water from her mouth to his mouth. It might not be a very hygienic act but when one loves another person, nothing is unpleasant to them. If he again rejects such romantic play while dinning, I guess this is not a man for her. This message is specially written for ladies but it applies vice verses as well. Woody Allen said..."To love is to suffer. To avoid suffering one must not love. But then one suffers from not loving. Therefore to love is to suffer, not to love is to suffer. To suffer is to suffer. To be happy is to love. To be happy then is to suffer. But suffering makes one unhappy. Therefore, to be unhappy one must love, or love to suffer, or suffer from too much happiness. I hope you're getting this down". "I think is quite simple. If he is crazily and madly in love with her, he should be brave to tell to the world." So true and precise. I have been with people where it was more or less a private relationship between he and I, it isn't worth the time. You want to be someone who is willing to scream it from a mountain top! Open your eyes and ears, I am sure you would meet your ideal man. Your compliment is most appreciated. You make my day.